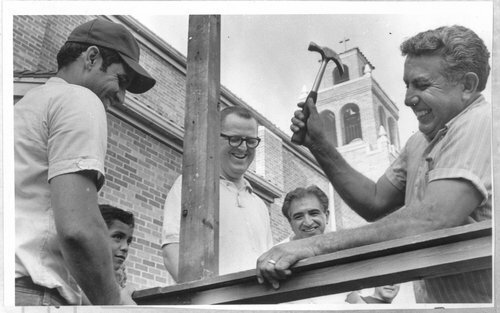 This black and white photograph shows Jesse Campos nailing together boards for a booth outside Our Lady of Guadalupe Catholic Church for the annual Fiesta Mexicana in Topeka, Kansas. The individuals have been identified from left to right as follows: Calixto Martin Jr., Christopher Cervantez, the Rev. Ed Fagan and Jim Martinez.